I’m a bit of a question-asker. I always have been. I was the little girl, grilling her mom with the never ending “why”? I don’t think God minds us asking questions. Jesus asked us many questions. In fact, in asking questions I have begun to understand more fully the grace of God and His sovereignty in my life. As I have grown in my faith, however, the questions have not stopped, but simply changed. So in honor of question-askers everywhere, here are some questions I would ask God. Maybe I will get to in heaven. Some are big, perhaps unanswerable questions. Others are small, trivial, even silly questions. But again, I don’t think He minds. Did Jesus really need to suffer and die on the cross in order to bridge the gap between man and You? Will we remember one another in heaven? Does our whining and complaining sound like constant noise or do you not find it bothersome? What about Your Church most grieves You? What most pleases You? How should the Church handle the issue of homosexuality? Are we doing more damage than good? Why did you plant the tree of the knowledge of good and evil in the first place? Wouldn’t it have saved us all a lot of pain if You never had? Are there other universes, beyond ours, that exist? Cockroaches? I mean, really? Are they necessary? Do you hate or are indifferent to religion? Why was Jesus’ ministry so short? Is it true, as I suspect, that much of the Mid-West is to blame for cheesy and unexplainable trends like mom jeans, daytime soaps, and the immortal mullet? (Sorry if you are from the Mid-West. I love Mid-Westerners. It’s just a theory, I have). Would the Apostle Paul cringe at the idea that the letters he wrote to various churches are now regarded as the Word of God? In Revelation, it says that there is a name written on Christ that only He knows…I have dwelt on this verse so many times and I would so love to know that name….the very name of God, that only He Himself knows. 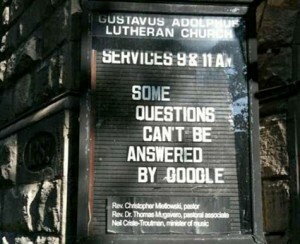 Okay, what questions would you ask God, from the theological and serious, to the trivial and silly? Lay ’em on me. Today’s post inspired by Sarah Jaggard’s blog post here. How old is the earth?! That’s a good one and it would also help answer so many other questions. What do I do now? That’s my one and only question for God right now, that plagues me from sunup until the wee hours of the following day, each and every day. What do I do now, God? Direct me. I wish I could tell you the answer to that question friend. I really do. I’ll try not to give you some cliche nice-ism answer, but know this–abiding in Him is always the right answer. Thanks Nicole. I’m trying. I’m trying to do what God wants, and what’s right. I’m terrified though. My husband has *come home*. He’s moved to another state, BEEN been with another woman, completely abandoned all responsibilities, and then came home. It’s says, God HATES divorce. But does God want me to accept this? I don’t know. So, direct me. He’s so much bigger than our marriage issues. He’s so much wiser than I’ll ever be. I just wish He was louder than my own thoughts (or maybe its my kids I’m having trouble hearing Him over? LOL). -Why are there certain Pastors (who will reamin unamed) that do and say horrible things and still have large ministries. -Do you love women God? I am not always sure. – In Genesis chpt 3 verse 22…why did you not want us to eat from the tree of life. Didn’t Jesus die to give us eternal life, what is the difference between life through him and the eternal life we would have had then…the answer is probably obvious I just don’t see it. -If I don’t want to be a stay at home wife or have kids, could I still be a good Chritstian Wife/Woman. – What does the Horse that Jesus is going to return on look like, cause I bet it is AWESOME! Great questions Kristin. Now you’ve got me thinking. As far as your Genesis question, my understanding is that the tree of life gave immortality, not eternal life with God. Immortality would be a curse, despite what we sometimes believe or the movies tell us. God, in His wisdom, was protecting Adam from a life that never ends vs. never-ending life with God in heaven. And in my opinion, yes, you can be a Godly Christian woman without having kids or being married. That would be a great post for another time. Thanks for sharing these. Loved them! What about a Godly Christian Women who wants to get married, but does not want to have kids…? I haven’t been able to find the answer to that one in the bible. But there are A LOT of Conservative Pastors that say if you don’t want to have kids you have no business getting married. Well, I would ask those pastors where in the Bible it dictates that the purpose of marriage is to have children? Marriage serves many purposes, that are outlined in scripture, that have nothing to do with baby-making. The reverse is really true–if you wish to have kids, you just need to make sure you are married. :) Not the other way around. I was reading the Genesis passage this very morning. It struck me too. And then I reasoned (and I could be wrong) that because of the fall that had just taken place, eating from the tree of life would mean we would forever be separated from God. We would be eternal in our separated state. Like Nicole says, immortality. It is Jesus’ death and resurection that allows us to have eternal life, but it also means we are no longer separated from God. The veil was torn! What really stumps me in Genesis is 3:8, “Then the man and his wife heard the sound of the LORD God as he was walking in the garden in the cool of the day, and they hid from the LORD God among the trees of the garden.” Walking in the garden…hmmmmm. Gives me goosebumps to think about this one. Was he in human form then? What happened to no one can see God and live? This has stumped me throughout the Old Testament. Seemingly physical language is used when describing God or the things He does and His encounters with others. Can’t wait to ask God about this, and a million other things too. That last one is a really good question! It totally gives me goosebumps too, to think about God walking around in the garden with them! I always imagined it was really Jesus there, walking in the garden. He has always existed after all. Who knows though. Like you said, it could just be descriptive language. However, I think Adam and Eve knew God intimately and personally in ways we cannot imagine. Regardless, it is so cool to think about. What’s the deal with dinosaurs? Did the Leviathan actually exist? My inner nerd came out on this one for sure. I totally agree with the homosexuality question too. Man oh man. Agreed. Inner nerd came out, but that’s okay. We all have one. Okay, you vote telepathy and I vote teleportation. Paris anyone? Why, qui! What about Griffons man I really wish he made them. They are my favorite make belief creature! I love the questions you posted. I think I would ask almost all of them! -I’m with you on the unicorns and mermaids question! As a follow up though, I would ask, so then why did you decide to create other weird animals like platypuses, ostriches, and the narwhal (the sea-dwelling version of a unicorn)? -Where did all of our myths and stories about super heroes and mythical creatures come from? Did some of those actually exist? -Why did you choose to give us so much grace? -Will there be animals in heaven? -Revelation also talks about Jesus writing a new name on a white stone for each of His followers. I’m so curious to know the new name He has given to me. -How did you know that Devin and I would fit so perfectly together? -Why are there some people that I love that may not ever believe and go to heaven? I could probably think of a hundred more questions, but I keep getting side tracked because I keep thinking about how incredible God is and how blown away I know I’m going to be when I see Him face to face! Animals in heaven? Well, there are the bizzaro creatures described in Daniel. Who knows if they actually resemble anything we have seen with our own eyes. And I so understand on your last question. So many people I love will not know Jesus…but I get to keep approaching His throne on their behalf. Great stuff Ashleigh. Thanks for playing! I would add mosquitoes to cockroaches. And I think I’d want to know who God’s favorite theologian was (my guess is it’s someone history’s already forgotten). Fair enough on the mosquitoes. Although can I tell you…I have never been bitten by one. I must have some kind of off-putting blood. They land on me, look around, and then buzz off. And great question. I really do wonder who God’s fave theologian would be? I’m sure you’re right too…someone we have long forgotten.